From the opening scene of a dead man face down in a pool to a star’s tragic descent down the stairs into madness, Sunset Boulevard is a Hollywood classic that ranks near the top of the 100 best films of all time. Joe Gillis (William Holden) is a down-on-his-luck Hollywood writer in need of a break. He’s overdue in his rent, and his car will be repossessed if he doesn’t find work soon. By chance, he ends up at a seemingly deserted mansion on Sunset Boulevard. After stashing his car in the garage, Joe discovers he’s not alone. He’s initially mistaken for an undertaker and discovers this place—the interior a musuem to a glorious past—is the residence of Norma Desmond (Gloria Swanson), a reclusive silent film star, who is catered to by her devoted butler, Max (Erich von Stroheim). “The whole place seemed to have been stricken with a kind of creeping paralysis. Out of beat with the rest of the world. Crumbling apart in slow motion,” observes Joe. When Norma learns he’s a writer, she demands he read a script she’s been working on. Salome is meant to be “her return.” With nothing pressing, Joe agrees, thinking, “Sometimes it’s interesting to see just how bad, bad writing can be.” He soon sees an opportunity to milk Norma for money while he “fixes up” her script. The next morning, however, upon discovering his things have been brought to the house, Joe realizes he may not be as in charge of his con as he thinks. As he continues to work on Norma’s script, Joe becomes more and more the “kept” man. At Norma’s New Year’s Eve party, where he is the only guest, Joe learns just how in over his head he is. Norma Desmond is a “cougar” long before the term was ever coined. Unable to escape the trap he’s partially devised for himself, Joe settles into his new life. That is until a script reader, Betty Schaefer, convinces him to help her work on a new script. He begins to slip out nights to work with Betty. She’s engaged to marry Artie, a friend of Joe’s, but the two grow closer as they work on their script. Then Norma discover’s their project, “Untitled Love Story”, by Joseph C. Gillis and Betty Schaefer. 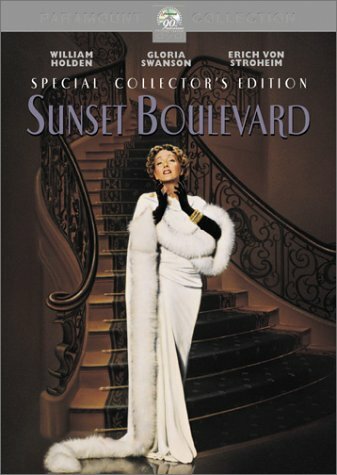 Sunset Boulevard has to be one of the most quotable movies with such lines as: “I am big. It’s the pictures that got small.” “There was a time in this business when they had the eyes of the whole wide world. But that wasn’t good enough for them. Oh, no. They had to have the ears of the world, too. So they opened their big mouths and out came talk, talk, TALK!” “You see, this is my life! It always will be! Nothing else! Just us, the cameras, and those wonderful people out there in the dark!…” For many more quotes, visit here. Several real people and places make appearances, or are referred to, in the course of the narrative. Several scenes take place at Schawb’s Pharmacy, a real pharmacy/soda fountain that—until 1988—was at the intersection of Sunset Blvd. and Crescent Heights Blvd. In both the film and real life, it was the hangout for writers, actors, and directors. There’s the bridge game of “waxworks”, featuring silent film stars Buster Keaton, Anna Q. Nilsson, and H.B. Warner. You may recall Warner also appeared in the previously reviewed Topper Returns. When visiting the very real Paramount Studios, Norma visits the Cecil B. DeMille on the set of Samson and Delilah, a very real film DeMille directed and which was released in 1949. Then there’s Hedda Hopper, famous Hollywood gossip columnist and former actress, who appears late in the film as herself, reporting from the scene of Norma Desmond’s bedroom. Though considered a film noir, Sunset Boulevard is unusual in that it’s not so much about solving a murder. We know Joe is dead at the beginning, and though we don’t immediately know, it’s soon clear who will kill him and likely why. The film is more of a portrait—some might say an indictment of how easily Hollywood uses and discards people. It’s intimately tied to the era in which it’s filmed. With the studio system long gone, it might be difficult to quite capture the film’s semi-documentary, biographical nature. 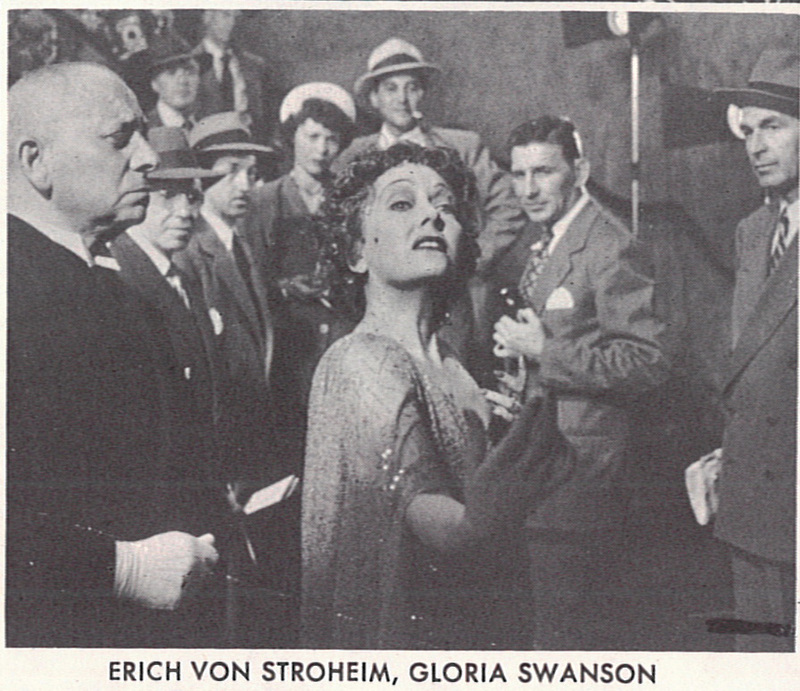 Swanson’s own publicity photos were used to plaster the mansion, and in one scene, we see a clip of her in Queen Kelly (1929), which was directed by von Stroheim. Sunset Boulevard, or Sunset Blvd. as it was originally billed, rightfully ranks high on best of lists. Worthy of multiple viewings, it should not be forgotten as easily as Norma Desmond was. Sadly, in talking with the younger people of today, so few seem aware of the vast catalog of cinematic oeuvres, great and small. Except at the college level, films are often not seen as texts worthy of study. Yet in many cases, they are as meaningful as the great literary classics by Austen, the Brontes, Dickens, Hawthorne, or Tolstoy. Norma Desmond is more than a match for Miss Havisham any day! Films deserve a greater “reading” than being dismissed as mere fleeting entertainment. All right, Mr. DeMille, I’m ready for my close up. By the way, it’s interesting to note several actresses were considered for the role of Norma Desmond before Gloria Swanson won the part. Mae West and Mary Pickford turned the role down. Before William Holden, Montgomery Clift was to play Joe, but backed out, and Fred MacMurray turned the role down. It’s almost too difficult to imagine anyone else in these iconic roles.